The effects of the absence of the delta brainwave on Fry (4ACV10). The Delta brainwave is found in animals, robots, and certain trees (3ACV07). The Brain Spawn attack it with a stupefaction field. This causes people and robots to become stupid. The effects on trees is unknown. Since Philip J. Fry does not possess the brainwave, he is immune to the Brain Spawn attack. The Legion of Mad Fellows are able to read people's thoughts from their delta brainwave (ITWGY). 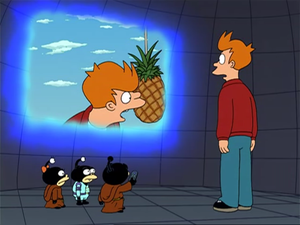 It is possible that the Brain Slugs feed on the delta brainwave, because the one who caught Fry died from starvation, although it is also possible that this was just intended as a joke about Fry's stupidity. (2ACV08). It is also possible, while unlikely, that the Hypnotoad uses the brainwave to hypnotize others. This is evident when Fry was capable of commenting on Everybody Loves Hypnotoad by saying "This show has been going downhill since season 3" and everyone else seemed to like it (4ACV06). The delta brainwave is technically present in every episode (as there is at least one more character in every episode). This list deals with appearances of the term. This page was last edited on 1 December 2013, at 23:06.